All equipment is selected upon a quality to value ratio weighted towards exceptional quality and a superb value. "Thanks for keeping the vinyl love alive! I'm going to stop there to see your LPs." "Your willingness to teach me about taking care of my records & my turntable made a great impression on me & I'd love to keep going to you for my analog needs!" STEREOPHILE & ABSOLUTE SOUND have both praised our wide analog selection. ABSOLUTE SOUND said "Gold Sound simply had too many turntables to even begin to judge them. VPI, Rega P3, Thorens, Pro-Ject - the list is seemingly endless. Gold Sound premiered a Thorens. It sure looked awesome & offered further testament to the boom in vinyl." Gold Sound stocks over 100 new & used turntables, plus many cartridges, phono preamps & accessories. We display 15 new 'tables, mostly from Europe or the U.S. & over 20 guaranteed used 'tables. The 5 most affordable 'tables recommended by STEREOPHILE, as well as the 5 recommended by ABSOLUTE SOUND are here. STEREOPHILE & ABSOLUTE SOUND recommend over 80 Gold Sound turntable-related products. No other Colorado store has this selection of affordable through high end turntables, plus cartridges, tonearms, phono preamps & record cleaners. We have 7 new 'tables with built-in phono preamps, starting at only $119, including an aluminum platter & tonearm, cables, plus a diamond needle magnetic cartridge. The built-in phono preamp lets you connect the turntable to any receiver, amplifier, most mini systems & even directly to computer speakers without a stereo system. Even our least expensive turntables have a one year parts & labor warranty. Many competing turntables only have 3 month warranties. Our better turntables have two or three year warranties. At $149, some of our turntables have a USB output so you can connect the 'table to a computer, to record an LP onto a CD, hard drive or iPod file. You can record just the songs you want & skip tracks, if desired, when you play them back. While many stores have forgotten or never discovered the joys of records, we've always sold more turntables than CD & DVD players combined. In addition to Colorado's best turntable selection, we stock many cartridges, mostly from the U.S. or Europe. We also have many record cleaners, phono preamps & accessories. We have new VPI Travelers for $1499 with a free $260 Grado cartridge. AV Showroom awarded the Traveller, "Best new product." Stereophile said "the Traveler isn't merely reasonably priced - it's a remarkable bargain, built to last a lifetime. And it's made with love, right here in the U.S."
When you buy a turntable here, we set it up, including mounting, aligning & balancing the cartridge. Other stores & internet sellers usually can't, won't or don't know how to do this. If the cartridge is not set up properly, the turntable will not sound right, plus the cartridge & your records can be damaged. Denver's record stores highly recommend Gold Sound. These stores have tens of thousand of records, new & used, in Denver, five miles or less from our store. REGA, made in England. All are 33/45 & manual. Gold Sound is Colorado's only dealer displaying Rega's newest turntables, the Planar 2 & Planar 3. Both include glass platters. THORENS All Thorens are made in Germany w/cartridges. The 240 & 295 have attractive natural wood bases. VPI, U.S. made, TRAVELER, only $1299 with $240 Grado or Ortofon cartridge. 4,000+ LPs; plus many CDs, DVDs, pre-recorded cassette & reel tapes, plus new LPs, CDs & tapes for sale: Rock, Jazz, Classical, Opera, Big Band, Country & Folk. Local sales only. CD sales have steadily dropped as turntable sales have strongly increased. People of all ages & backgrounds buy turntables. 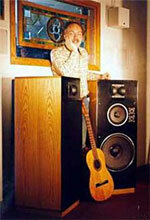 Some are in their teens or twenties & buying their first sound system. Some are much older & have had records records & turntables for many years. An LP sounds better than the same recording on CD & much better than an MP3. Neil Young & many other musicians greatly prefer the sound of an LP over a CD. A musician who has made many analog & digital recordings said that analog sounds better for strings, voices & piano. "The most dramatic revelations [of turntables' superior sound are] 3 areas. DYNAMIC changes much closer to real instruments. STAGING LP dimensionality highlights a sense of space dramatically better. It's not even close. "Between LP & CD, there's no comparison! The CD sounds like a good hi-fi, but the LP breathes life into the sound, a far-from-subtle difference. Vinyl communicates the music's emotional pull better than any digital format. "When the CD was introduced, it was called "perfect sound forever." The problem was that early CDs sounded thin, harsh & unpleasant. Vinyl records are a pretty good way to store info. Sound is inherently analog; converting sound to record grooves doesn't involve the information loss as their conversion to digital. With the turntable, there's hardly any background noise; sound is 3-dimensional, detailed & has a liveness that CDs or iPods cannot begin to match." "There's no reason why digital music must sound worse than analog. 10 years ago Sony introduced the Super Audio Compact Disc, that holds its own against vinyl records. But SACDs never caught on & the mass market moved in the opposite direction with MP3 & iPod. MP3 is a digital compression technology that throws away lots of information to reduce file size. It's quantity over quality. Listening to an iPod through a high-end audio system is painful & a big step backward from CDs." 2] VINTAGE RECORDINGS Most music on LPs is not available on CD. Whether you enjoy rock, jazz, classical or country, there's lots on LP that you can't find on CD. There's many new LPs made. Record printing plants are working 24 hours to meet demand. 4] BONUS FEATURES LP's larger size gives you better cover art, liner notes & sometimes posters & lyrics. There are books devoted to LP album art & posters. Reading a record's liner notes written by Leonard Bernstein, Nat Hentoff or the performer is a real treat. Classical & opera albums often include attractive booklets with the composer's story, plus the complete opera libretto in the original language & English, printed large enough so it can easily be read. Seeing a large color photos of Tchaikovsky's piano definitely adds to the enjoyment of the music. GROOVIN' ON VINYL, Turntables cool again with young, is in Washington Times. "A new generation of music lovers grooves to the sweet sound of vinyl. Turntable sales topped 32,000, [60% above the] 19,000 sold the same month last year. CD sales dropped 15%. Record sales increased 70%. A record's sound quality is superior to a digital file. Analog sounds much warmer & more natural than digital. Madonna, U2, Led Zeppelin, Wilco, Amy Winehouse & others release vinyl albums. If you want a record collection that lasts a lifetime, you need a real turntable with a good needle that won't damage the record. It will bring so much more from the grooves that it will leave your jaw on the ground." At Gold Sound, we have over 43 years of turntable experience. The turntables we now stock are excellent values, durable & have earned praise from many reviewers. As turntables increase in price, their many parts improve, including the motor, motor power supply, platter, base [or plinth], tone-arm & cartridge. Each part makes a definite difference. Just putting a better cartridge on a lesser turntable won't provide the performance of a better turntable. The turntables we stock have all withstood the test of time. THORENS has been in business over 125 years. GRADO, MARANTZ, ORTOFON, over 50 years. PRO-JECT, REGA & VPI, over 30 years. MUSIC HALL, over 12 years. We stock three different turntables with a built-in phono preamp, analog to digital converter & USB output. The USB output lets you connect the turntable directly to your computer & easily transfer your LPs onto your computer hard drive or to record on to a CD. Our $149 Audio-Technica ATPL60USB automatic turntable has a built-in phono preamp & Analog-to-Digital converter with a USB port, Audacity computer software & a USB cable to connect to a computer. 8] Optional, heavy lucite platter. This $129 option further improves the sound. With the Debut Carbon, an LP will sound better than the same recording on CD. With lesser tables, CDs sound better than an LP. You can record vinyl directly onto a computer in any digital file format, which can import directly to popular programs like iTunes to enjoy music on a portable audio device. This is compatible with Windows, Mac OS & Linux systems. We stock 3 affordable alternatives. 1] The $15 Brush-it is a carbon fiber & velvet brush, which removes dust while reducing any static charges. 2] The $20 Audio-Technica AT6012 includes record cleaning fluid, plus a record brush. The fluid is $15/bottle. Both are in stock. 3] The $80 Spin-Clean totally submerges your records in a cleaning bath. Next to the VPI record cleaning machines, the Spin-Clean is the best way to clean records. For over 100 years, Thorens has handcrafted superb European turntables with pre-installed cartridges & excellent tonearms. All Thorens have electronic speed control; unlike many turntables, you don't have to change the drive belt to a different pulley. All our Thorens turntables have solid wood or MDF bases. This helps the sound, appearance & durability. Thorens is one of handful of world audio companies that has had the honor of a full-sized book devoted to their history. Thorens began in Switzerland in 1883. In 1966 Thorens moved to Germany. Thorens turntables over 50 year old, like the TD124, originally $99 in 1957, now sell up to $2000. GRADO ALL MADE IN N.Y.
REFERENCE SONATA 1, $600, "Improved detail, transient speed, more seductive mids & improved hall sound very noticeable." CADENZA BRONZE, PHONO CARTRIDGE of the YEAR, $2199, "The Bronze has a slightly warmer, more romantic sound better suited to classical music, acoustic jazz & voices. We often listen to the Bronze for the sheer pleasure of its sonic personality [plus one of the] highest neutrality." We have five new amplifiers from $349 & in stock with built-in phono preamps. Most competitor's models, including most NAD, Sony, Harman-Kardon & Denon models do not include a phono preamp. MUSIC HALL USB-1, $249, 33/45 rpm, includes phono preamp, Analog-Digital Converter, USB output [easily transfers LP to CD, computer hard drive, lpod, etc. ], Audacity software, USB cable, +/-10% pitch control, strobe & detachable RCA cables. The newest Pro-Ject turntable is the $299 Essential which includes an Ortofon OM3 cartridge, a wood base & a wood platter. 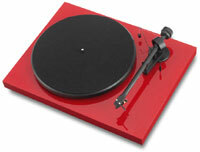 The Essential, our least expensive European-made turntable, is available in matte red, black or white. PRO-JECT RPM1, $499, has many upgrades over the Carbon. The RM1.3 features a 1.25" thick resonance-optimized wood platter, a three-point wood plinth, plus an isolated motor assembly, optimized for low noise & speed stability. Three nylon cone feet reduce noise & vibration. RCA cables can detach, permitting easy upgrades. [Many 'tables over $1000 don't have detachable cables.] It looks like a modern sculpture & is enhanced by your choice of a high gloss red, black or white finish. 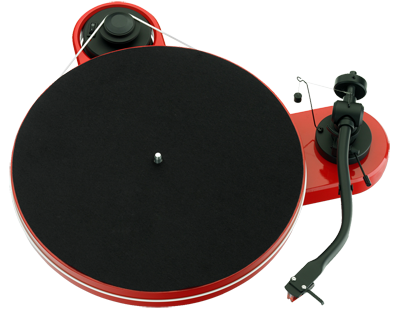 RP1, $475, Rega's newest & most affordable turntable; includes pre-installed diamond needle, moving magnetic cartridge. 3] 8 lb. platter weight, for better speed consistency. 4] Large AC motor, for better speed consistency. 6] Four 2" high conical aluminum feet, reducing feedback or unwanted resonance. We have a good selection of used turntables. We also have new cartridges, stylus and needles.